Children are always welcome in Meeting for Worship. However, during Meeting for Worship, members of Durham provide care for the smallest ones if parents or caregivers would like to accept this offer. We encourage toddlers to visit Sunday School as long as they feel comfortable or return to the nursery to play. Children ages 2-12 gather for Sunday School twice a month during Meeting for Worship on the first and third Sundays. We have been following a Montessori-inspired curriculum, that encourages children to wonder about questions of the spirit and work with hands-on materials to deepen their understanding of sacred stories and parables. Middle and High School age youth also meet twice a month on the first and third Sundays during Meeting for Worship to discuss issues relevant to them. 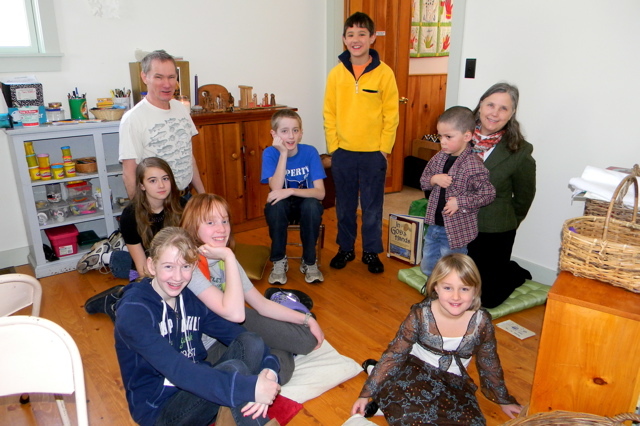 We explore many “why” questions, learning about the diverse faith communities in Maine and the Quaker Testimonies- Simplicity, Peace, Integrity, Community, Equality and Sustainability.